Mindsight’s exposure to hundreds of world class customer service organizations prepares our consultants to deliver keen insights into your contact center. Through this depth of knowledge, Mindsight can help boost both the performance of your technology solutions and address your specific industry challenges. With our help, we can increase your net promoter score (NPS), improve customer satisfaction, drive revenue growth, and strengthen team satisfaction within budgetary means. With Mindsight’s Contact Center Roadmap, our consultants will leverage hundreds of combined years of experience to deliver real-world solutions to real-world problems. We prefer to talk candidly and work transparently, and by understanding your business goals, we can chart an achievable roadmap to meet them. The Contact Center Roadmap consists of three stages: current state analysis, plan development, and engagement deliverables. Below is an example of an implementation timeline within a Contact Center Roadmap. Critical technologies and process improvements are arranged on the timeline to solidify a concrete plan of attack to improve your contact center operation. The Contact Center Business Review is a four-hour onsite strategy session with analyses and recommendations as deliverables. Our senior consultants, who specialize in contact center technology, strategy, and solutions, will meet with your management team to gather as much information as possible to inform their analysis. The Strategic Analysis takes our consultancy one step further. It combines a 1-2 week onsite evaluation with a customized report and presentation on the findings. Like the Business Review, our consultants will meet with business leaders to determine objectives and goals. From there, we will step into the shoes of the customer, shadow agents, and observe the strengths and weaknesses of the department. Through these procedures, we can gain the most insight and provide the best recommendations. No one understands your business like you do, so Mindsight is happy to focus our Contact Center Roadmap on those areas you feel need the most attention. While we provide a general analysis of your contact/call center operations, we can also cater the Roadmap to assess workforce optimization, processes, call flow, or any specific facet of your contact/call center. The goal is to drive improvement and refinement in the contact/call center, and that objective plays out differently for every environment we assess. If you need a more customized solution than what is listed here, please contact us today. We will make sure that you are connected with one of Mindsight’s contact center consultants. Contact Mindsight today at www.gomindsight.com/contact-us. 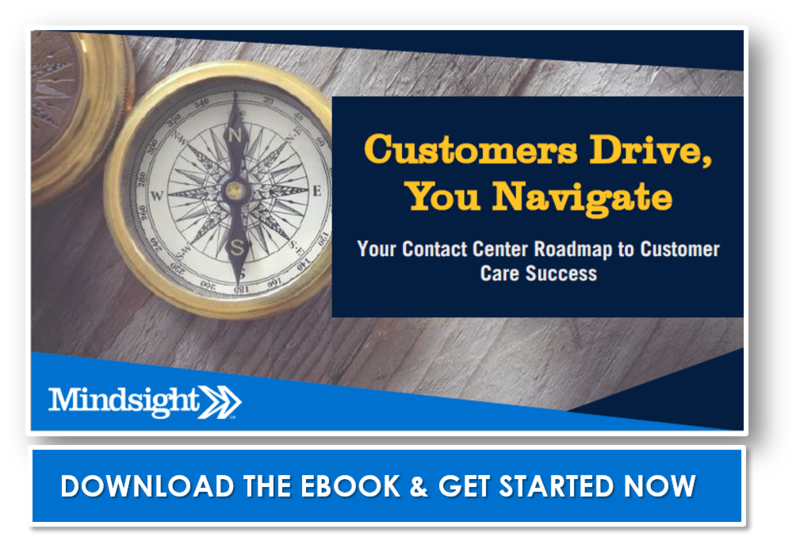 Download Our Free eBook – Customers Drive, You Navigate: Your Contact Center Roadmap to Customer Care Success.